Coach Pete Carroll said Penny will push Chris Carson for more playing time and expects the duo to form a one-two punch, John Boyle of the Seahawks official site reports. Penny rushed four times for 28 yards in Saturday's playoff loss to the Cowboys. Penny gained just six yards on four carries in Sunday's win over the Cardinals. Penny (knee) is listed as active Sunday against the Cardinals. Analysis: A full practice participant all week, Penny still needed to get through a pregame workout unscathed to make his first appearance since Week 14. With the health of his knee approved by the training staff, he'll be available to the Seahawks backfield, though his workload could be determined by game flow. Chris Carson will get the initial touches but could be pulled if Seattle gets out to a comfortable lead, which would leave Penny and Mike Davis to vie for snaps. Coach Pete Carroll said Penny (knee) will be a game-day decision Sunday against the Cardinals, John Boyle of the Seahawks' official site reports. Analysis: A full practice participant throughout the week, Penny nonetheless finds himself listed as questionable for the regular-season finale, per Boyle. Penny seems more likely than not to suit up and could actually get some extra work if the Seahawks jump out to a lead. 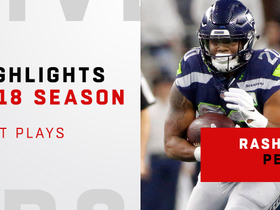 The team needs a win to ensure a first-round matchup with Dallas instead of Chicago, but it still makes sense to ease up on Chris Carson after three straight games with 22 or more carries. Sunday's kickoff is scheduled for 4:25 PM ET. Penny (knee) is listed as questionable for Sunday's game against the Cardinals, Bob Condotta of The Seattle Times reports. Analysis: It's a bit surprising to see Penny with a game designation after he logged full practices Wednesday and Thursday. It's possible he had a minor setback during one of those sessions, but the more likely scenario is that there isn't really any doubt about his Week 17 availability. The Seahawks could give the rookie a bit of extra run in an effort to keep Chris Carson fresh for the playoffs. Penny (knee) was a full practice participant Wednesday, John Boyle of the Seahawks' official site reports. Analysis: In the midst of absences the last two games due to a knee injury, Penny put in one limited practice last Friday. Since then, coach Pete Carroll was optimistic about the running back's potential to return Week 17 against the Cardinals, and an uncapped session Wednesday sets up Penny to do just that. 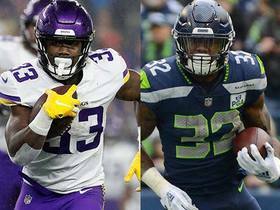 With the backfield now at full strength, Penny will join Mike Davis as options to spell starter Chris Carson, who has racked up 77 touches the last three contests versus 35 for the remaining backs. Coach Pete Carroll expects Penny (knee) to practice Wednesday, John Boyle of the Seahawks' official site reports. Analysis: Penny has missed the last two games due to a knee injury, but a glimmer of hope regarding his health arrived in the form of a limited practice last Friday. Carroll piggybacked on that development Monday and reiterated it Wednesday, telling Boyle that Penny should suit up this weekend against the Cardinals if he makes it through the week of prep "OK." Penny's initial listing for Week 17 will be revealed on Wednesday's practice report. Coach Pete Carroll is hopeful Penny (knee) returns for Sunday's game against the Cardinals, Brady Henderson of ESPN.com reports. Penny (knee) is listed as inactive Sunday versus the Chiefs. Coach Pete Carroll didn't sound optimistic about Penny (knee) being able to play Sunday against the Chiefs, Brady Henderson of ESPN.com reports. "We're holding out hope that maybe on gameday [Penny] can do something," Carroll said Friday. "We'll find out. He did a little bit of work [Friday] for the first time this week and his recovery is going really well." Analysis: Although he referred to Penny as a game-day decision, Carroll doesn't seem to have any expectation that the rookie will be able to play. Penny returned to practice Friday as a limited participant, logging his first activity of any kind since Week 14. An absence Sunday would free up a few extra touches for Mike Davis and Chris Carson, with J.D. McKissic potentially getting the occasional snap. Penny is viewed as a game-day decision for Sunday's matchup with the Chiefs, John Boyle of the Seahawks' official site reports. Analysis: Per Boyle, Penny is listed as questionable on the Seahawks' final injury report after returning to practice Friday as a limited participant. His availability shouldn't have a huge impact on the Seahawks' game plan, as they can simply allow Chris Carson and/or Mike Davis to take a few more carries if the rookie isn't available. Davis handled the vacated snaps in last week's 26-23 loss to the 49ers, but Carson might be the beneficiary if Seattle were to play with a lead this time around. Penny (knee) is listed as questionable for Sunday's game against the Chiefs, John Boyle of the Seahawks' official site reports. Analysis: Penny didn't practice Wednesday or Thursday, but he might be listed as a limited participant Friday once the Seahawks update their final injury report. A limited session could set Penny up a game-time decision ahead of Sunday's 8:20 p.m. EST kickoff. Penny (knee) was held out of practice Thursday, Brady Henderson of ESPN.com reports. Analysis: With a pair of DNPs under his belt this week, Penny is trending toward a second consecutive absence as a result of a knee injury. He could flip the script Friday by returning to practice in some capacity, making the Seahawks' final Week 16 practice report one to watch out for. With Penny's status still in limbo, Chris Carson (28 touches Week 15) and Mike Davis (13) are poised to handle the bulk of the backfield reps Sunday versus the Chiefs. Penny (knee) won't practice Wednesday, but he has a shot to do some work during Thursday's session, Curtis Crabtree of Sports Radio 950 KJR Seattle reports. Analysis: Unable to practice in any capacity last week, Penny is now in danger of missing a second straight game Sunday against the Chiefs. Gregg Bell of The Tacoma News Tribune believes the Seahawks' recent signing of running back Bo Scarborough is a hint that Penny may be out for a while longer. 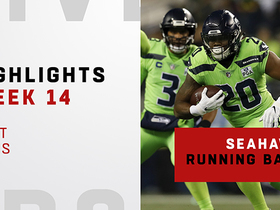 Chris Carson handled 22 of the team's 29 backfield carries during last week's 26-23 loss to the 49ers, with Mike Davis contributing five totes and eight receptions. Coach Pete Carroll was noncommittal about Penny's Week 16 availability Monday, the Seahawks' official site reports. "We've got to wait a couple of days here," Carroll said. "We'll see by Wednesday. He's working hard to try to get back, but it's not certain yet if he's going to be able to turn it around or not." Coach Pete Carroll said Penny (knee) had an MRI and isn't expected to require surgery, Gregg Bell of The Tacoma News Tribune reports. Analysis: Penny didn't practice this week and has been ruled out for Sunday's game in San Francisco. His absence should free up more work for Mike Davis behind starter Chris Carson, though it's also possible Carson or J.D. McKissic handles some of the vacated snaps/touches. While the rookie doesn't seem like a great bet to make it back for Week 16, the Seahawks hope he can play again this season. Penny (knee) won't play in Sunday's game at San Francisco, John Boyle of the Seahawks' official site reports. 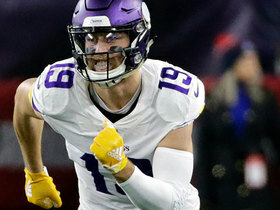 Analysis: The rookie seems to have injured his ankle during Monday's 21-7 win over Minnesota, though he still managed to gain 44 yards on eight carries. Penny's usual allotment of 4-8 carries likely will go to either starter Chris Carson or passing-down back Mike Davis, though J.D. McKissic might also get a few chances. A minor boost to Carson's Week 15 outlook is in order, though he likely will be playing without 340-pound guard D.J. Fluker (hamstring), who is listed as doubtful. Penny (knee) was held out of practice Thursday, John Boyle of the Seahawks' official site reports. Analysis: With back-to-back absences to open Week 15 preparations, Penny could be in danger of his first absence as a professional Sunday in San Francisco. Over the previous five contests, all of his work has occurred on the ground -- 7.8 carries per game -- so both Chris Carson and Mike Davis could benefit in the event Penny doesn't play or is limited this weekend. Fortunately for Penny, he has another practice to put himself in the running for active status. Coach Pete Carroll said Penny won't practice Wednesday due to a knee injury, Bob Condotta of The Seattle Times reports. Analysis: Penny strangely avoided all three Week 14 injury reports but still was listed as questionable ahead of Monday's game against the Vikings as a result of an ankle issue. He brushed it off and turned eight rushes into 44 yards in the victory, marking his fourth outing in five games where he averaged more than 5.0 yards per carry. The rookie hasn't been able to usurp Chris Carson for a featured role so far, and tending to injuries in back-to-back weeks won't help his cause. Penny rushed eight times for 44 yards in Monday's win over the Vikings. Analysis: Penny made solid reads and scampered for a combined 12 yards on his first two carries. 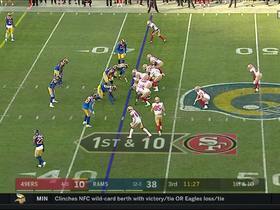 His big play came in the second quarter when it looked as if he'd be stopped for a loss near the left sideline, but Penny cut back and displayed his speed by running to the opposite sideline to gain 17 yards and a first down. These explosive bursts will keep Penny as the clear No. 2 back ahead of Mike Davis, but Chris Carson has a stranglehold on the top spot for now. Penny (ankle) is listed as active Monday against the Vikings. Analysis: Penny wasn't listed on Week 14 injury reports, implying he was a full participant in each practice. That said, he was given a questionable designation for this game due to an ankle injury. In the end, the issue didn't impact his gameday availability, but the rookie can expect to remain second or third fiddle out of the Seahawks backfield alongside Mike Davis and behind Chris Carson. Hurting Penny's cause further is a matchup against Minnesota's eighth-ranked run defense (99.2 yards per game). Penny is listed as questionable for Monday's game against the Vikings with an ankle injury, John Boyle of the Seahawks' official site reports. Analysis: Penny wasn't present on the injury report until Saturday so the specifics of the injury remain unclear, especially considering he wasn't listed as missing any practice. If able to play Monday, the 22-year-old should assume his usual complementary role to starting RB Chris Carson. Mike Davis would likely see an increased snap share if Penny is ultimately unable to suit up. Penny rushed seven times for 65 yards and a touchdown in Sunday's win over the 49ers. Offensive coordinator Brian Schottenheimer expects Penny to have a larger role in Seattle's game plan Sunday against the 49ers, Andy Patton of USA Today reports. "I expect that [Penny] will play well this weekend," Schottenheimer said. "Expect that we need to get the running game back going again and I think he'll be a big part of that." Penny rushed four times for four yards in Sunday's win over the Panthers. 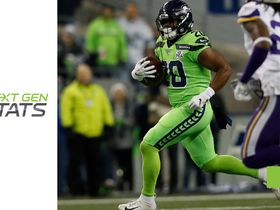 Analysis: Penny's carries were distributed between two different drives, as he clearly wasn't an integral part of the Seahawks' game plan while Chris Carson led the way with 16 carries for 55 yards. It appears Penny will need to break off big runs to lock in touches like he did in the two previous games, though he could see more work in Week 13 if the Seahawks jump out to a sizable lead in a home game against the 49ers. Penny rushed eight times for 46 yards in Thursday's 27-24 win over the Packers. Analysis: Penny's first carry was promising as he was held up in the backfield but made multiple cuts, ultimately recording a 38-yard gain. That striking rush showcases Penny's upside, but the rest of his outing was forgettable with just eight yards on his next seven carries. With Chris Carson back in the mix, Penny's role will likely be inconsistent going forward, but he did at least log more touches Thursday than fellow running back Mike Davis (six) handled. Coach Pete Carroll said Penny's workload is in jeopardy with Chris Carson (hip) returning for Thursday's game against the Packers, Gregg Bell of The Tacoma News Tribune reports. "When everybody's healthy, not everybody's going to get the ball a lot," Carroll said. "That's just the way it goes, so we'll figure that out." Penny rushed 12 times for 108 yards and a touchdown in Sunday's 36-31 loss to the Rams. Analysis: This is the production the Seahawks expected when they picked Penny in the first round of April's draft. With Chris Carson (hip) out, Penny outpaced Mike Davis, who rushed 11 times for 58 yards. This adds to the ambiguity in the Seattle backfield, but coach Pete Carroll could ride the hot hand Thursday against the Packers if Carson remains out. Penny rushed four times for 11 yards and caught all three targets for 13 yards and zero touchdowns in Sunday's 25-17 loss to the Chargers. 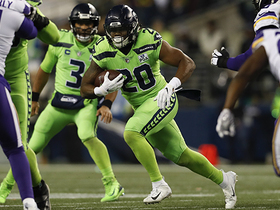 Analysis: Penny rushed once on the Seahawks' first drive, proving he was part of their game plan before Chris Carson left with a hip injury. Still, Mike Davis (22 touches) benefited from Carson's absence, leaving Penny with another disappointing outing. If Carson's injury keeps him out in Week 10 against the Rams, Penny may receive more chances. Penny may see an uptick in usage if Chris Carson (hip) sits out Sunday's game against the Chargers, Brady Henderson of ESPN.com reports. 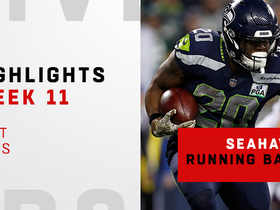 See the Next Gen Stats of Seattle Seahawks running back Rashaad Penny's crazy 17-yard run. 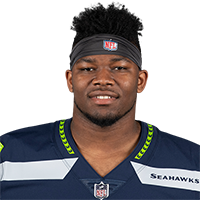 Seattle Seahawks running back Rashaad Penny runs for 17 yards. 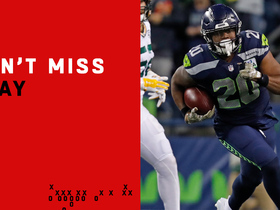 Seattle Seahawks running back Rashaad Penny fools defense on 30-yard run. 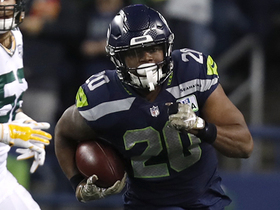 Seattle Seahawks running back Rashaad Penny bursts through the Green Bay Packers' defense in the red zone.